It is my great pleasure to come to this business luncheon today. I am particularly happy that I am not here alone but am accompanied by a 48-member delegation from Hong Kong. The people here with me today visiting your country include members of my government team and the Executive Director of our Hong Kong Trade Development Council (HKTDC) as well as Presidents of major Chambers of Commerce in Hong Kong and the Hong Kong Small and Medium Enterprises (SMEs) Association. Also present today are leading professional services representatives including the President of the Law Society of Hong Kong and representatives of the Hong Kong Bar Association and the Hong Kong Institute of Certified Public Accountants, as well as prominent architects, designers, insurers, real estate developers and entrepreneurs, and also a group of industrialists who actually specifically joined as they are looking to establish new manufacturing bases here in your country. So, this is a delegation of investors and professional service providers from a wide spectrum of Hong Kong's top businesses, and most important of all, this is a delegation of key people who can build and cement a long-standing and closer partnership between Hong Kong and Cambodia. (b) There is a lot that Cambodia can tap into with Hong Kong as your partner in the Mainland of China, our region and the wider world. We are much closer than we thought - I say this not just because of the proximity of Hong Kong to Cambodia but in light of the potential that the Hong Kong-Cambodia relationship could be further strengthened through trade, investment and business ventures. Let us look at our mutual trade figures. Hong Kong is Cambodia's eighth largest trading partner, 13th largest export market and seventh largest source of imports. And 13 per cent of your trade with the Mainland of China is routed through Hong Kong. But the current US$1.2 billion volume of trade in goods is just a humble sum that stands a high chance of expansion, especially if our trading relationship prospers in the areas of mutual investment and professional services, and especially when Cambodian enterprises understand what Hong Kong can do in facilitating business with you within the Association of Southeast Asian Nations (ASEAN) and between ASEAN and the wider Asia-Pacific region. We are close to each other with mere three-hour flights operated daily by three airlines between Hong Kong and your major cities, and we have 18 scheduled sailings weekly between our ports. With our soon-to-complete Hong Kong-Zhuhai-Macao Bridge and the high-speed railway later this year, Hong Kong will become a few hours closer to ASEAN by road and railway, and that could place our port and airport within closer reach for your shipments. For your information, Hong Kong's airport is the world's largest and most efficient cargo hub, ranked first for eight consecutive years, and our container port continues to be in the world's top five. With Hong Kong being a free port, Cambodia's exports can go to and pass through our city without any tariffs or duties. As we speak, Hong Kong is expanding its airport with a third runway, multiplying its air mail centre capacity to cater for increasing use of e-commerce, and adding purpose-built facilities for high-end logistics transshipment services. All of these projects are not just to cater for Hong Kong's population, but to serve global trade including the fast-growing manufacturing and trading businesses in this part of the region. This has indeed earned Hong Kong its remarkable status as the world's sixth largest trading entity in goods and 10th place in trade in services. So, Hong Kong is indeed bigger than its size suggests and a strong partner that Cambodia can leverage on. First and foremost, Hong Kong offers the most accessible, safe and secure gateway into the Mainland of China. There is one single and simple advantage that no city outside China, nor any city within the Mainland, could offer. That is the "one country, two systems" principle that Hong Kong is operating under. We are part of China and enjoy the natural advantages of having common language and culture; being an early and prime mover in the country's economic development; being the single biggest investor and trading partner; being the prime and biggest Renminbi offshore centre, accounting for 76 per cent of total offshore transactions; and having the national recognition that Hong Kong is China's international financial, trading and logistics centre, as proclaimed in the country's successive Five-Year Plans. Through our free trade agreement with China, companies in Hong Kong, including yours if they are established in our city, enjoy greater market access and easier inroads into the world's biggest and fastest-growing market. But the added and unparalleled advantage of Hong Kong is in the different and more open and business-friendly systems that we operate. This includes a legal system premised on the common law system; an internationally convertible currency; free flow of capital, information and people; and business and professional services that follow international standards and practices. The Central Authorities fully recognise Hong Kong's distinctive advantage. 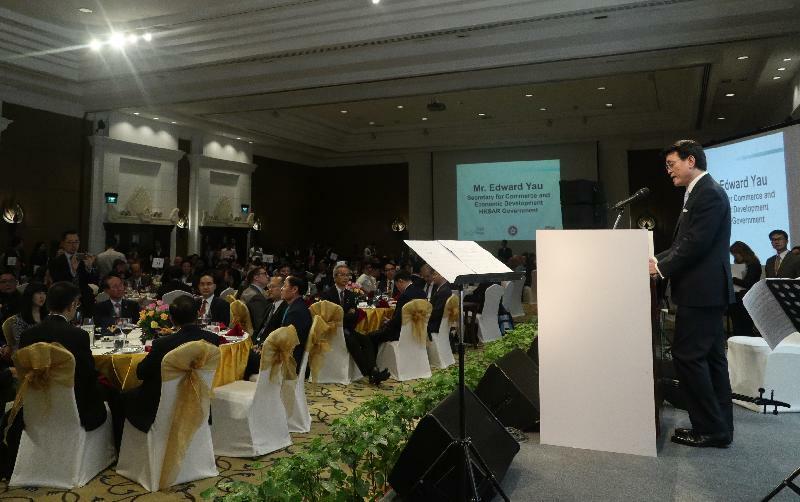 In a recently held summit organised by Hong Kong in Beijing on the subject of the Belt and Road Initiative, the Chairman of the Standing Committee of the National People's Congress said in the opening address that Hong Kong has an irreplaceable role in the Belt and Road Initiative and "the country will continue to need Hong Kong, as well as incorporate Hong Kong in the Belt and Road endeavour". 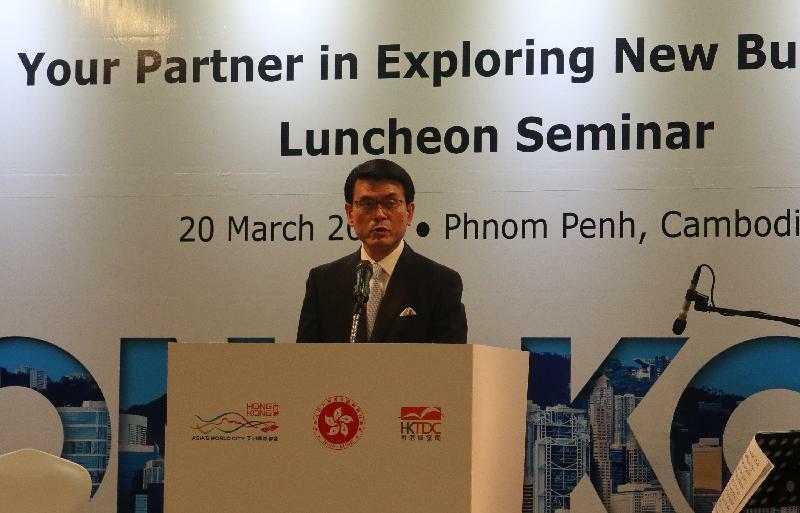 So, if the Belt and Road Initiative is something that could help drive better economic opportunities between Cambodia and China, Hong Kong is the gateway, the springboard and the crucial link you can tap into. But all these windows of opportunity that Hong Kong enjoys are not a windfall. We have earned them through decades of working hand in hand with our partners in the region and the world. ASEAN in particular has emerged to become Hong Kong's second largest trading partner in the past decade, leveraging on both China's opening up as well as the strength of ASEAN's economic development. Hong Kong has been fortunate to ride on this by ensuring that we are part of this process. When we say we have an unparalleled advantage, we share this with whoever does business with us. We are not just blowing our own trumpet. Hong Kong has been repeatedly named by the International Institute for Management Development in Switzerland as the world's most competitive economy, and the Heritage Foundation, the Cato Institute and the Fraser Institute in their respective studies have ranked Hong Kong consecutively over decades as the world's freest economy. All these global rankings have been earned by one very important principle we have followed throughout our development, and that is having the level playing field we practice in maintaining Hong Kong as a rule-based, free and open city not just for our own citizens but for all those we engage with in business. In maintaining a level playing field, our Government does not pick winners at will, nor do we elbow out losers. We treasure and respect the market as well as our partners through transparency, rule of law, protecting intellectual property rights, keeping a low and simple tax regime, and maintaining a clean and efficient Government. One would not even fear to take the Government to court in a dispute, thanks to the firm belief that our independent judiciary would act fairly without fear or favour. All these provide the greatest confidence to international businesses to choose Hong Kong as their home base for the region, and that explains why 8,200-plus international firms use Hong Kong as their regional headquarters or offices, the largest number in Asia, and why 37 per cent of the mushrooming start-ups in Hong Kong come from outside our territory. We believe an open, easy and facilitating market environment is vital, and hence we have recently introduced bold measures to reinforce this niche. We have proposed and will be putting into practice later this year a major tax cut by trimming our already low tax from the current 16.5 per cent by half, i.e. 8.25 per cent, for all enterprises in Hong Kong for their initial US$250,000 profit, making Hong Kong a very low-tax regime, if not the lowest in the world. One may say that you could only enjoy those benefits when you have your business anchored in Hong Kong. You would be only half right as Cambodia businesses can actually enjoy these when you partner with us. It has not been uncommon to see Hong Kong firms among the earliest investors in manufacturing, real estate and hotels when ASEAN countries' economies took off in the past few decades. This process is still ongoing and gaining momentum. Actually, we are encouraging our business people, in general trading or professionals and in companies big or small, to reach out to the wider market and ASEAN in particular. We have long been supporting our SMEs to build brands and upgrade their products and services through trade promotion, advertising and joining trade fairs and exhibitions outside Hong Kong. In our recently released Budget, we have injected a total of over US$300 million to help SMEs for such promotional activities and one specific measure is to allow them to apply the above funding to come to ASEAN, in addition to Mainland China. What Hong Kong can offer in the professional services is abundant and deep. Commonly sought-after services include legal, accounting, insurance, business consultancy, risk assessment and management, arbitration, dispute settlement, project financing and funding, bond issuing, construction, architecture and transport, just to name a few. These are highly specialised and sophisticated professional sectors that are operating in Hong Kong but serving the regional and global markets, particularly within our Asian time zone. Irrespective of their backgrounds as global firms or home-grown service companies, the professional services in Hong Kong pride themselves with the knowledge of business locally, regionally and internationally, and they maintain practices with high and international standards. I am sure Thomas So, the President of the Law Society of Hong Kong present here today, could tell you how well his lawyers community is connected with counterparts in about 40 countries along the Belt and Road, standing ready to be engaged in business deals, contract preparation and possibly building in your contract the necessary arbitration and dispute settlement mechanism. Kim Rooney of the Hong Kong Bar Association and Francis Law of the Hong Kong Mediation Centre and the Mainland-Hong Kong Joint Mediation Center would tell you that arbitral awards made in Hong Kong are enforceable in more than 150 jurisdictions around the world, including Mainland China. I am sure Nicholas Ho, Deputy Managing Director of hpa, though he looks very young, can tell you with confidence and experience about how a Hong Kong-based architectural firm could play a vital role in project management for a large-scale new town development in one of the ASEAN countries. Jeny Yeung of the MTR Corporation can tell you how this Hong Kong company has found success in managing and turning around subways in London, Stockholm, Melbourne and Beijing and is now a heavily sought-after partner for major railway developments around the world. We have also here key representatives of accountants, insurers, business consultants and bankers, as well as start-up companies in bio-medicine, artificial intelligence, smart city and Fintech areas that you can tap into, if you are interested in having them as partners for your new business ventures. Ladies and gentlemen, I can carry on this long list of examples but nothing is stronger than the single message that Hong Kong stands ready to connect, to partner and to build a trusted relationship with you and your country. Together we have now found a common platform by the signing of the ASEAN-Hong Kong Free Trade Agreement and a related Investment Agreement. Together we have seen business and investment flowing freely and strongly between our respective economies. Together we see also prospects for Hong Kong and Cambodia to seize on mutual trade and investment as the driver for closer and more prosperous economic development. Today's meeting turns a new page in our relationship. But this relationship is more than trade or business. It is one that is solidified by people-to-people bonds and cultural exchanges that could foster even closer ties. You, your company and the organisation you represent are key to all these. Last summer, your Royal Ballet performed in Hong Kong in celebration of our 20th anniversary. We have today a small performance from some young artists from Hong Kong. They are here to witness this new page in our close relationship. So, enjoy, and I look forward to seeing you all again in Hong Kong and here in Cambodia. Thank you.